Making sure you choose the right front door is essential. It can drastically alter the appearance of your home, so you need to be sure you have decided correctly. It must enhance and improve the exterior of your home, but also fit into your lifestyle and serve its purpose; protecting you and your family. There are several points you must consider before choosing a front door. There are a few factors that will inhibit some properties ability to choose a door, for example, the age of your property. If your home is a listed building, then you will have to follow certain guidelines when it comes to the size, style and material of door. Likewise, if you live on a street lined with similar looking houses, then you will have to find a door that is suitable and alike to those of the neighbouring properties. Living in a remote area will mean that will have much more say in the style and design. Here are some factors that will hopefully help you to decide on how to choose a new front door. The best way to find a door is to initially set your budget. You will want to do this prior to anything else so that you don’t get your heart set on a door you cannot afford. Rather than opting for the cheapest, focus on the quality of the materials and door as a whole. You will find that choosing a cheaper version may mean it will require replacing in a year or two. The different size, materials and style doors, all come with varying price tags. The cheapest option that you can go for would be a veneered timber front door. This, however, is unlikely to last as long as a bespoke solid hardwood front door. Your main aim, when choosing a new front door is to find one that will add beauty and value to your home without costing you more overall. You may also want to consider the installation of energy-efficient doors. These can be more expensive upfront but will help to decrease your overall energy bills, and in the long run, will save you money. Ultimately, the design of your new front door comes down the custom and age of your home. You want to find a door that is going to complement and enhance your home’s natural beauty. Choose a simple and contemporary looking front door if your home is a more modern property. There are several characteristics of a door that you need to bear in mind. The size of door you need to purchase is an important factor to consider. One mistake that many people make when choosing a new front door, is thinking that they come in one standard size. This is not the case and doors vary considerably in size. To make sure you have the correct size door to fit the door frame, you need to accurately measure it and communicate these measurements to your supplier. It is also important to focus on the height of the internal flooring as well as the door width when opened. If these aspects aren’t measured correctly, then you may find you can’t walk around the door once it has been fitted. In order to be sure you have accurate measurements, make sure to take three readings of both the width and height of the door. You should then take diagonal measurements to work out whether the door aperture is square. Once you have done this, you then need to use the smallest width and height and pass this information on to your door specialist. Once you have worked out what size you need your front door to be, it is important to decide on the colour. 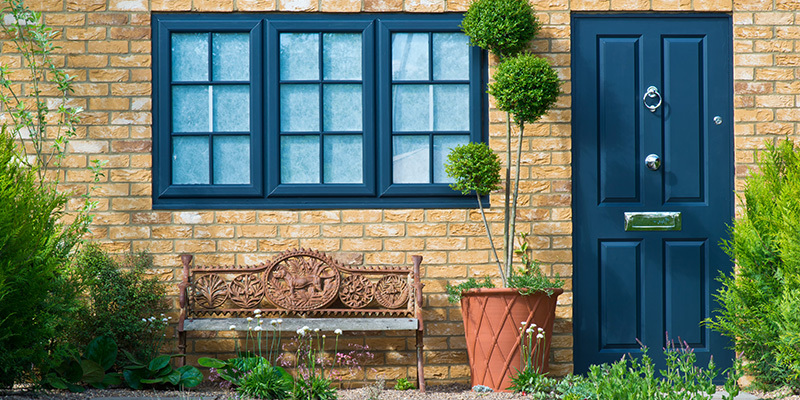 Do you stick with the colour on your existing front door, or are you looking for a change? The most traditional homes opt for darker shades, such as navy blue, black, red or dark green. These front door options suit most types of properties and are timeless colours guaranteed to last you for years to come. Nevertheless, if you’re looking to steer away from the darker shades, then pastel coloured front doors have become a popular choice. Light grey, light oak, cream, Chartwell green and aluminium grey are all elegant and tasteful hues that would easily complement a variety of properties. You also need to decide what colour door frame to have. Would you prefer it to be matching to the colour of the door to achieve a more seamless finish, or are you looking for a contrasting colour that will frame your door perfectly? If you are looking for a different colour door frame, but one that will complement the colour of your door, then white is a safe option. It is important to spend some time looking into which colours complement each other – you’ll want to get this aspect of the door correct first time. The presence of glass is an essential aspect of a front door and, therefore, requires some consideration. If you are looking to achieve complete privacy, then there is actually no point adding in glass to the design. You’d be better to opt for a full height solid front door. However, if the room in which your front door opens into, such as a hallway, requires some natural light, then glass will be an important addition to the door. Alternatively, if you are looking for maximum protection, but still require the presence of natural light, then you can opt for long panels of frosted glass. This ensures the light from outside is allowed in, but the naked eye can’t. Because glass is widely available in a variety of styles, textures and decorative finishes, it should be relatively straightforward for you to find the most suitable combination of glass for your front door. You also need to think about the glazing options available to you; are you looking for single, double or triple glazed glass panels? The addition of stylish door handles and letterboxes can be the finishing touch on your front door. These vital components of a door are usually available in chrome, gold, white and black. If you are thinking of a white uPVC door, then matching it with white door handles and a letterbox can look most appealing. On the other hand, a popular choice for composite doors is the addition of chrome of gold coloured handles and letterboxes. If you are thinking of including a door knocker or a weather bar into the design of the door, then make sure that these are in the same colour as the other aspects of the door. For example, if you have a chrome door handle, make sure that the knocker, letterbox and weather bar are all also chrome. This is an aspect of your door that is not necessary, but purely down to personal preference. However, having a house number either installed onto or beside your front door is always a good idea for the delivery drivers. If you are opting for the presence of a house number, then we do suggest that you opt for the same colour scheme that you have chosen for the rest of the door furniture (the door handles, knocker and letterbox). This will help to tie all aspect of the door together. Alternatively, if you are looking for a house number plaque that can be placed on the external wall next to your front door, then take a look at the House Nameplate Company. Because every home is unique and individual, choosing a door that suits your home is indispensable. Choose a door that best suits and contemplates your house as a whole. Ensuring that you, your family and your precious belongings are kept safe is paramount, so make sure to install a door with all the necessary high-performance security features. In order to maximise the safety of your home, avoid doors with glazed panels. Opt for toughened or laminated glass panels if you are determined on this style of door. Fitting a door chain, a hinge side above and below hinges of wooden doors and a small window alarm, are all safety features that you should be considering. There are regulations that must be met under the Building Regulations Section Q when it comes to choosing a door. The section states that all homeowners must have front door letter plates that are not accessible by human hand, along with a door viewer and limiter. Before making a decision on the type of door you can envisage in your home, make to look at the quality of locks, hinges, materials and strength of glass. The type of material that you decide to have your replacement door made from is going to be one of the main contributing factors to the cost. uPVC Doors– this style of door is low maintenance, one of the cheapest alternatives, and provides great thermal insulation. They do, however, often come in only a limited selection of styles and colours, and their aesthetics are not always appreciated.  Composite Doors – these were introduced almost ten years ago and serve a purpose for those individuals who are after the look of a classic timber door but with all the benefits of using modern materials. This style of door is ideal for keeping out draughts, they are minimal maintenance and come in a variety of sizes; standard and bespoke. With the wood sourced from sustainable forests, the timber core composite doors are a much more environmentally friendly alternative to glass reinforced plastic doors. These doors can also then eventually be recycled. A robust thermoplastic door skin will also mean that they’re incredibly durable. However, because of all these features, you must expect the price of a timber core composite front door to be the most expensive. Veneered Timber Door – If you’re not meticulous about the quality of door you choose and are looking for a much cheaper option, then a veneered timber door from your local DIY retailer is ideal. Varnishing it yourself and then re-doing this every year, is, however, part of the deal. These doors are not known for their thermal performance, so you will also want to invest in a draught excluder. Veneered Timber doors may be cheap initially, but the time-consuming upkeep and addition of other features, such as high-quality locks, will all add up. All in all, it may be more cost-effective to invest in a bespoke high-quality door that will last longer and require less maintenance in the future. Solid Hardwood Doors – These types of doors can be made to measure and, designed by the homeowner and are ideal for period properties. They do, nevertheless, require some maintenance and upkeep. Over time, the colour will start to peel or fade away, so you will need to re-apply several coats of paint or varnish. The door may crack, absorb water and ultimately rot if you avoid doing this. Solid Hardwood doors are ideal for adding a touch of luxury to any home. Overall, these are just some of the chief factors that you are compelled to consider before deciding on a new door. If you’re looking for a new front door in Milton Keynes start by setting out a budget, choosing a style and material that suits your property and then making sure that this specific door incorporates all the necessary safety features.